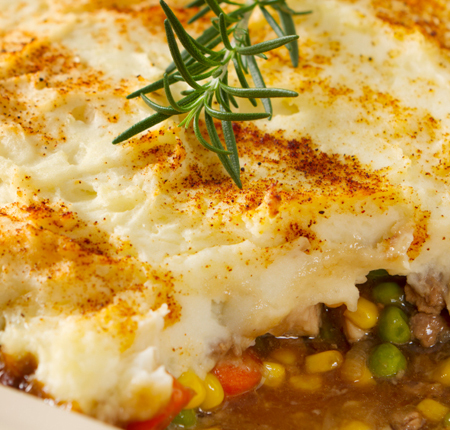 Try this recipe with McCain ground beef and garlic mashed potatoes recipe for a mouth-watering twist on a traditional favourite. Preheat oven to 400°F. Lightly grease an 8”x8” baking dish and set aside. Place the potatoes and garlic in a pot of lightly salted, cold water. Bring to a boil and simmer for 12-14 minutes or until tender. Drain the cooked potatoes, reserving one cup of the liquid. Mash the potatoes and garlic along with the reserved liquid. Season to taste with salt and pepper. Set aside. Heat a large skillet over medium-high heat. Add oil, then ground beef; cook until beef is browned. Add onions and peppers; cook until tender. Drain off the fat, return skillet to heat and add in the remaining vegetables, sauces and spices. Simmer gently for 10 minutes. Season to taste with salt & pepper. Transfer mixture to baking dish and press it down. Top with the garlic mashed potatoes and lightly sprinkle paprika over top. Place the baking dish in oven and bake for 30 minutes. Remove from heat and serve immediately. Yellow potatoes are mashed with cream cheese, parsley and chives for herbal filling to stuff baked tomatoes. 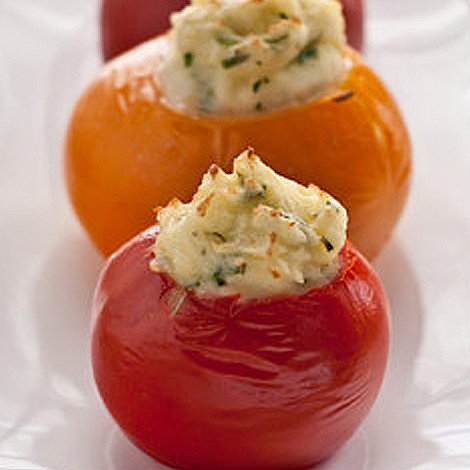 Kids will have fun scooping out tomatoes and stuffing them with the whipped potato stuffing. Place the potatoes in a saucepan with cold water and cover. Bring to a boil and then let simmer until the potatoes are cooked and tender. Peel potatoes and press them through a sifter. Immediately after, weigh out 9 ounces of puréed potatoes and place them in a medium metal bowl. Working quickly, whisk the flour into the warm potatoes, then whisk in 2 tablespoons of whipped cream. Add 1 egg and continue whisking until batter is smooth, add the second egg, and then add the yolk. Hold the whisk with some of the batter over the bowl. The batter should fall in a thick stream but hold its shape when it hits the batter in the bowl. If too thick, add a little more whipped cream. Add salt and pepper according to taste. Heat a large non stick skillet over medium-low heat. Pour between 1 and 1 1/2 teaspoons of batter onto the skillet for each pancake. Cook until the bottom is browned, 1 to 2 minutes. Then, flip to cook the second side, about 1 minute. 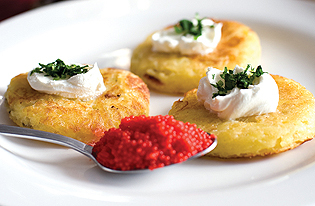 The blinis should be evenly browned with a small ring of white around the edges. Transfer the blinis to a small baking sheet and keep warm while you make the remaining blinis, wiping the skillet with a paper towel between batches. Serve while hot. 4 portions. As seen in popular women’s and cooking magazines! 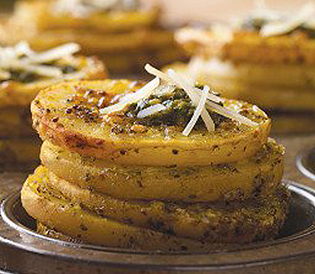 This Pesto Parmesan Potato Stackers recipe includes Roasted Yello potato stacks layered with fresh basil pesto and melted Parmesan cheese. For a twist, layer potatoes with your favorite flavors—from garlic and olive oil to mozzarella and marinara. Preheat oven to 400°F and spray muffin tin with nonstick cooking spray. Peel the potatoes (optional) and thinly slice them by hand, with a mandolin or food processor fitted with slicer blade, discarding rounded ends. Place in mixing bowl, add shredded parmesan and pesto, and mix well with a spoon, separating potato slices so that all are evenly coated with mixture. Add salt and pepper to taste. Stack slices beginning with smaller potato pieces at the bottom in the prepared muffin tin until they reach the top of the muffin tin. Scrape bowl to remove all remaining cheese mixture and spoon over potatoes. Bake for 25 minutes or until potatoes are tender when pierced with a sharp knife. Makes 12 side dishes or appetizers. Preheat oven to 400°F and spray muffin tin with nonstick cooking spray. Peel the potatoes (optional) and thinly slice them by hand, with a mandolin or food processor fitted with slicer blade, discarding rounded ends. In a small sauce pan heat olive oil and garlic on medium heat until garlic is fragrant (approximately 2 minutes). Remove from heat. In a mixing bowl, combine sliced potatoes, garlic olive oil, pepper and sea salt. Stack slices beginning with smaller potato pieces at the bottom in the prepared muffin tin until they reach the top of the muffin tin. Bake for 25 minutes or until potatoes are tender when pierced with a sharp knife. Makes 12 side dishes or appetizers. Preheat oven to 400°F and spray muffin tin with nonstick cooking spray. Peel the potatoes (optional) and thinly slice them by hand, with a mandolin or food processor fitted with slicer blade, discarding rounded ends. Place in mixing bowl, add remaining ingredients, and mix well with a spoon, separating potato slices so that all are evenly coated with mixture. Stack slices beginning with smaller potato pieces at the bottom in the prepared muffin tin until they reach the top of the muffin tin. Scrape bowl to remove all remaining cheese mixture and spoon over potatoes. Bake for 25 minutes or until potatoes are tender when pierced with a sharp knife. Makes 12 side dish or appetizers. Celebrate National Barbecue Month than with America’s favorite vegetable. 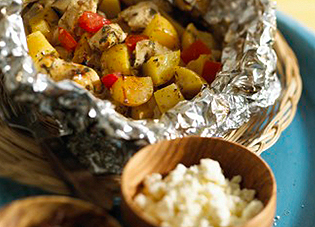 This full-meal recipe can be prepared in the oven or on the grill – and thanks to the foil packaging, they’re virtually mess-free! And the best part—just 250 calories per serving! If requiring a gluten-free recipe, check the label of the indicated (*) recipe ingredients to ensure they are gluten-free. Place potatoes in large saucepan; cover with water. Bring to boil over high heat; reduce to a simmer and cook until just fork tender. Drain and cool; cut into quarters. Set aside. Wisk together satay sauce and mayonnaise in a large bowl. 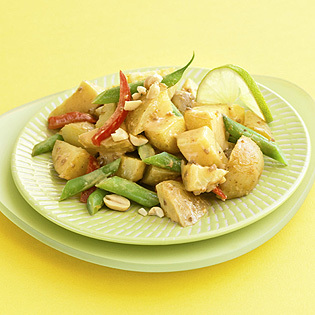 Add reserved potatoes, green beans, peppers and peanuts; stir to mix. Serve immediately or chilled. Consider serving with: grilled shrimp, broiled fish or chicken stir-fry.